A free to play farm simulator Farm Days can be played on your web browser and allows players to manage their time, resources and finances as the work towards building up a successful farm competing with other players or working alongside them. The core focus of Farm Days is to build up your farm by earning money, purchasing new buildings, gaining XP and slowly unlocking content and more high level crops, trees and structures to perfect your farm. Manage both your time and your resources/ingredients as you try to make money and advance in the game, competing against other players to have the most efficient and lucrative farm in the game! The game works on a production cycle where players can create items that can be used and consumed in quests, sold on markets or on the Orders to create a gold income. However, many ingredients can also be used to make a self-sufficient farm that supports itself. Starting out with a single wheat field and well to draw water from players can grow wheat crops; a versatile resource that can be sold or taken to the mill and converted into different products: flour for baking or feed for livestock. As chicken or cow feed you can feed it to your animals and in turn they will then produce eggs and milk, more ingredients that can be sold or further used, along with flour, to make various cakes and pies in the Bakery depending on what type of item you get from other crops and trees, such as pumpkins, plums, strawberries and more. As each building can only construct one item at a time players must manage their time and order in which they create things to stay efficient; if the Bakery requires flour as a final ingredient to make a Pumpkin Pie then it is more efficient to make this item (15 seconds) at the Mill before spending longer grinding beets into sugar (1 minute). 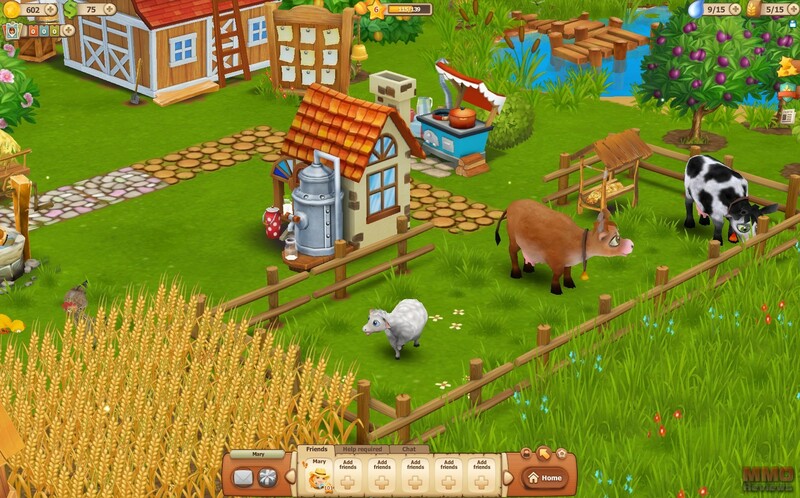 Similarly players must manage their storage in the form of their Barnyard, having too much surplus of one resource can hold up production to where you are forced to sell or potentially throw away currently unneeded resources. Throughout the game new quests are opened up to players that will reward them with gold, items and XP to help them level up; quests typically consist of completing certain tasks, making shop purchases and creating produce from new recipes. Players can get different types of quests including land quests that when completed give players more plots of land to build on and expand the size of their farm, these quests are unlocked when players reach specific levels. The game constantly rewards players for making certain game achievements such as building five buildings, catching 50 butterflies, harvesting crops from 1000 garden beds; these achievements grant players some Farm Bucks as well as Quick Grow Seeds that can speed up any crop and make it ripen instantly. Players can gain Quick Grow Seeds and other items by asking friends for them in the game, encouraging players to work together, furthermore they can form Unions to make larger groups that assist each other and can compete against one another for ranking. The premium currency in the game is known as Farm Bucks, and works as a secondary currency to gold, with it players can help speed up their game by rushing completion of structures being built, crops being grown or items being created allowing a quicker way to advance. Farm Bucks can also be used to purchase any missing ingredients a player may not currently have when creating a recipe or completing a quest, as well as buying some Farm Bucks only items in the shop or purchasing more than the allowed number of a particular item, e.g. players can buy two of the same crops/trees/buildings with gold, but must then spend Farm Bucks to buy more. Farm Bucks are earned each time a player levels up, by completing certain features and quests, but primarily they can be gained by actively watching video advertisements to apply Farm Bucks to their account. Finally, they can of course be purchased using real world money.